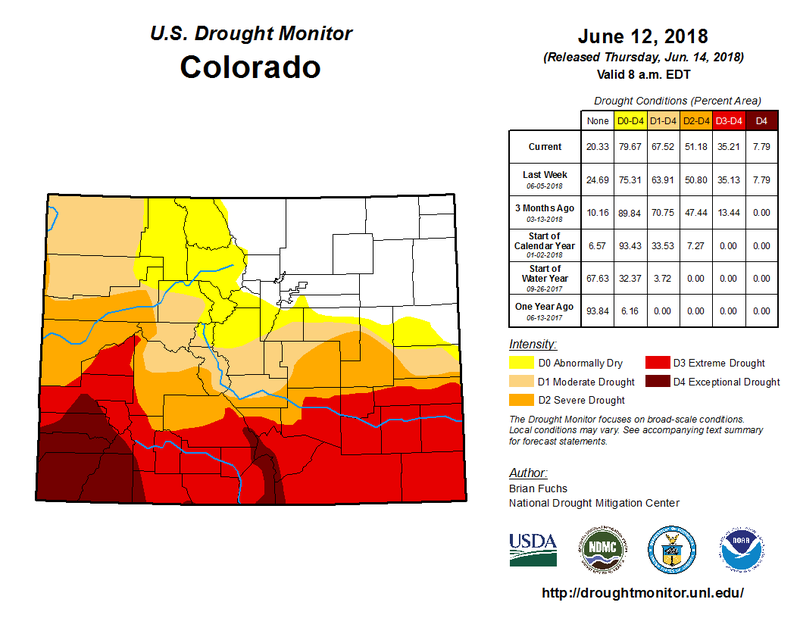 Colorado Drought Monitor June 12, 2018. Colorado Springs Utilities administrators say they are already seeing some of the initial effects of low precipitation levels and snowpack. Kalsoum Abbasi, a planning supervisor in water conveyance group at Colorado Springs Utilities, says the area had average levels of moisture and snowpack in the last few years, meaning the water storage levels are looking good, despite the drought. Some of the major storage reservoirs like Pueblo, Turquoise, and Twin Lakes all have good water supplies right now. Abassi says there is about three years’ worth of water built up in storage, so there likely will not be any water restrictions for residents anytime soon. Looking to some of the other bodies of water, like Rampart Reservoir west of Woodland Park, water levels are already seemingly low. Abassi says last summer, average customer demand for water was about 85-90 million gallons per day. This year, Colorado Springs Utilities says demand is running closer to 120 million gallons per day on the hot and dry days we have seen so far. Gov. John Hickenlooper signed an executive order Tuesday to ensure vehicles sold in Colorado meet current emissions standards even if the Trump administration decides to slash regulations for the automobile industry. The executive order requires Colorado to adopt California’s limits on greenhouse gases that spew from tailpipes. California has a legal waiver under the Clean Air Act that allows it to have more stringent emission standards than those set by the federal government. Colorado will join a dozen states, including California, and the District of Columbia seeking to lock in place current Obama-era vehicle emission standards. Those 2012 standards are designed to lead to more fuel-efficient vehicles on the market in coming years. New cars, light trucks and SUVs will have to average 55 miles per gallon come 2025, a rule that was incorporated into California’s regulations. This would complement Colorado’s goal of cutting 2005 greenhouse gas emission levels 26 percent by 2025. Vehicles on the road make up the state’s second-largest source of greenhouse gas emissions after electricity generation from power plants, according to the state’s most recent data. Environmental groups are lauding the executive order as a win for the state at a time when the White House is rolling back environmental protections. A legal showdown between the Trump administration and California is expected over that state’s decision to set emission requirements that are more stringent than under the Clean Air Act. Attorney General Cynthia Coffman, a Republican who often has opposed government regulations and is sympathetic to the oil and gas industry, did not return a request for comment on whether Colorado will defend California’s stance. That call ultimately may fall to whichever attorney general candidate is elected in November. Democrats Joe Salazar and Phil Weiser say they would be willing to defend California’s waiver if challenged by the Trump administration. Republican candidate and 18th Judicial District Attorney George Brauchler did not return a request for comment. Today’s order requires the Colorado Department of Public Health and Environment to propose a rule that incorporates California’s regulations by August for possible adoption by the end of the year. Hickenlooper’s executive order said the expected plan by the Environmental Protection Agency to roll back greenhouse gas and fuel efficiency standards could have “serious consequences” for Colorado’s effort to meet its own clean energy goals. In a statement, he said the executive order was also about protecting Coloradan’s quality of life. The auto industry, however, is raising concerns about costs for consumers. Tim Jackson, CEO and president of the Colorado Automobile Dealers Association, said according to most recent reports on car sales, Coloradans drive more trucks than Californians do. That’s one reason why he says it’s crazy to have Colorado’s adhere to California’s emission standards. “It’s going to be a harder standard for automakers to achieve so they will have to disincentivize, which means raise the price on the vehicles that Coloradans like to drive,” he said. He added that if consumers can’t afford new cars they may keep older, more polluting ones. A May report by Denver’s Department of Public Health and the Environment says Denver was ranked the 11th most polluted city in the nation for ozone levels in 2017 and the leading cause is vehicle emissions. Last year, the Colorado Department of Public Health and Environment issued 45 Action Day Alerts, meaning air pollution levels were so high that the agency recommended that people with certain health conditions like asthma stay inside for certain activities such as exercise. There have been 11 such warnings so far this year. 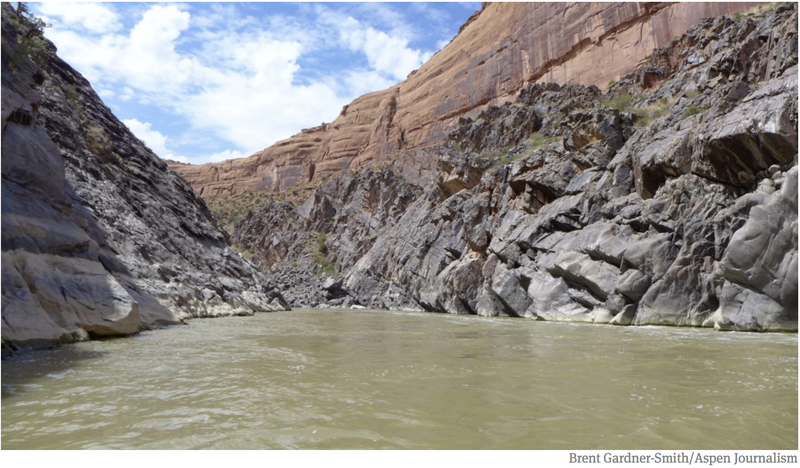 Much of the water that leaves Colorado bound for Lake Powell passes through Westwater Canyon, An ongoing study suggests that in the face of a severe drought, not enough water is left in the Colorado River basin to keep Lake Powell high enough, or Westwater wet enough. Photo credit Brent Gardner-Smith. Not so coincidental, really. [Jeffrey] Kightlinger and I converged with other Colorado River folks on Santa Fe for an Upper Colorado River Commission meeting this week. A bunch of side meetings are also underway to, in the words of one of the convergents, “try to jump start” the stalled Drought Contingency Plan discussions. Kightlinger’s right about the “uncharted territory” thing. The DCP is an effort to cobble together a map of the water management terrain ahead as we’re speeding toward – well, speeding toward something that we’re not quite sure what it is but it’s probably really bad. My main reason for tagging along to the Santa Fe meetings is the chance for some “side meeting” time with Eric Kuhn, my collaborator on a new book that is looking closely at how we got here. In particular, we’re looking at the “charts” (to borrow Kightlinger’s metaphor) that we did make beginning with the 1922 Colorado River Compact – the rules guiding how we would develop the river’s water, and our hydrologic understanding that was used to draw them. The reason this is so “uncharted” is because we (they?) didn’t do a good job at all of contemplating the “what if” scenario of river less than their rosy planning assumptions of a booming Colorado River with surpluses for all. (f) Further equitable apportionment of the beneficial uses of the waters of the Colorado River System unapportioned by paragraphs (a), (b), and (c) may be made in the manner provided in paragraph (g) at any time after October first, 1963, if and when either Basin shall have reached its total beneficial consumptive use as set out in paragraphs (a) and (b). So bad were their maps at the time that they actually thought there was not only plenty of water for full development of the farms and cities we now see, but that they would have to reconvene in 1963 to parcel out an additional allocation of more water! By 1963, there was not only no discussion of a surplus, but active discussion of how to cope with the fact that there wasn’t enough water for even the basic allocations laid out in the compact. And yet, here we are today, 50 years later (and a nearly century after the compact was signed), still with no chart. 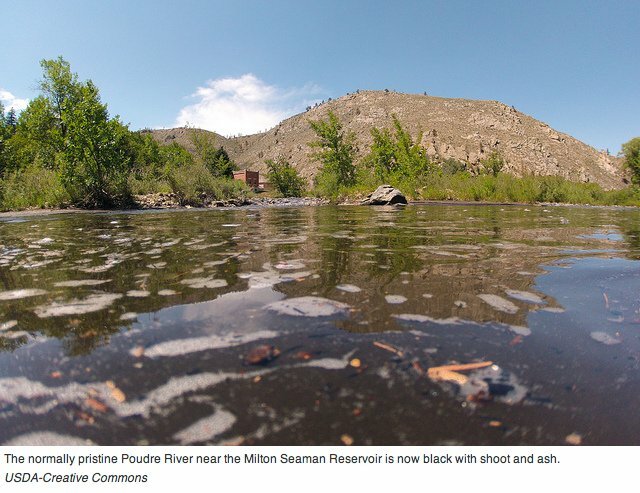 Wildfires can contaminate nearby streams and watersheds through mobilization of sediments, nutrients and dissolved organic matter, straining the capabilities of downstream municipal treatment facilities, a new report co-authored by CU Boulder researchers shows. To simulate the effects of a medium-temperature wildfire, the researchers heated soil and organic deadfall in a furnace to 225 degrees Celsius (437 degrees Fahrenheit). The materials were then leached into tap water and treated using conventional processes. In response to persistent and prolonged drought conditions throughout the southern half of the state and along the western border,the Governor ac​tivated the Colorado Drought Mitigation and Res​ponse Plan for the agricult​u​ral sector on May 2, 2018, additional information ca​n be f​ound HERE. The month of May was, on average, the second warmest on record and the warmest since 1934. While daytime highs were above normal, night time highs were also well above normal, which may have contributed to early snowmelt across much of Colorado. June has continued to see well above average temperatures with most of the state experiencing temperatures 4-10 degrees above normal. Precipitation for both May and June to-date has largely been well below average statewide, these conditions contribute to fire danger. 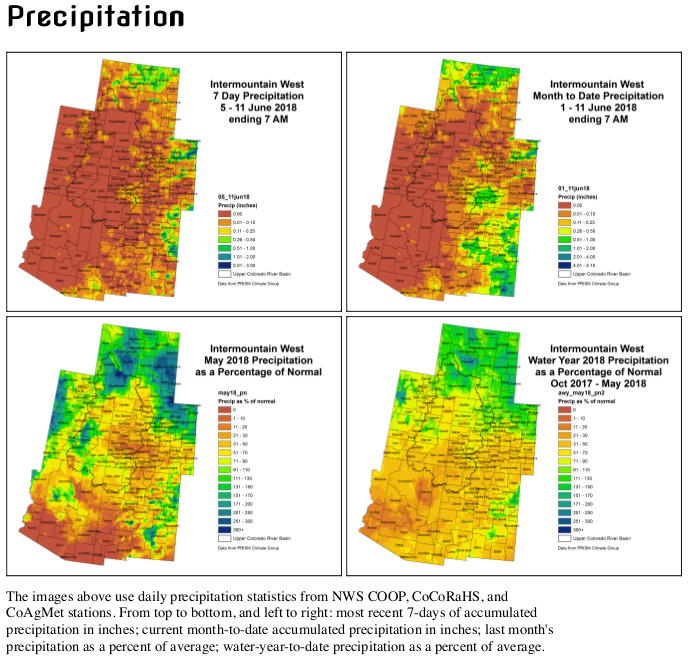 ■ SNOTEL sites from the Grand Mesa to Mesa Verde National Park have broken low records for both peak snow accumulation as well as water-year to date precipitation. ■ Water demand is increasing; and reservoir storage in the Southwest basins of the ​San Miguel, Dolores, Animas & San Juan, Gunnison and Rio Grande​ have seen significant decreases in reservoir storage in recent months. The reservoir storage for the Southwest basins of the ​San Miguel, Dolores, Animas & San Juan has dropped from ​91 percent of normal storage last month to 75 this month and has the lowest storage levels in the state. ■ Isolated cattle sell off and prevented planting of some acreage has been reported. High hay prices make purchasing adequate supplies to maintain livestock a challenge. There are some reports of cattle being moved to alternative grazing areas, including out of state, and we anticipate additional cattle sell off. Unless conditions improve additional prevented and failed crop acres are likely. ■ Windy, dry conditions have continued to fuel fires in June leading to numerous large wildfires, including the 416 Fire near Durango that is now the 5th largest fire in Colorado history. Weather forecasts indicate the potential for large scale moisture statewide in the coming week and in particular in southwest Colorado. While this will help alleviate drought and fire potential, it also introduces the potential for floods near burn scars. 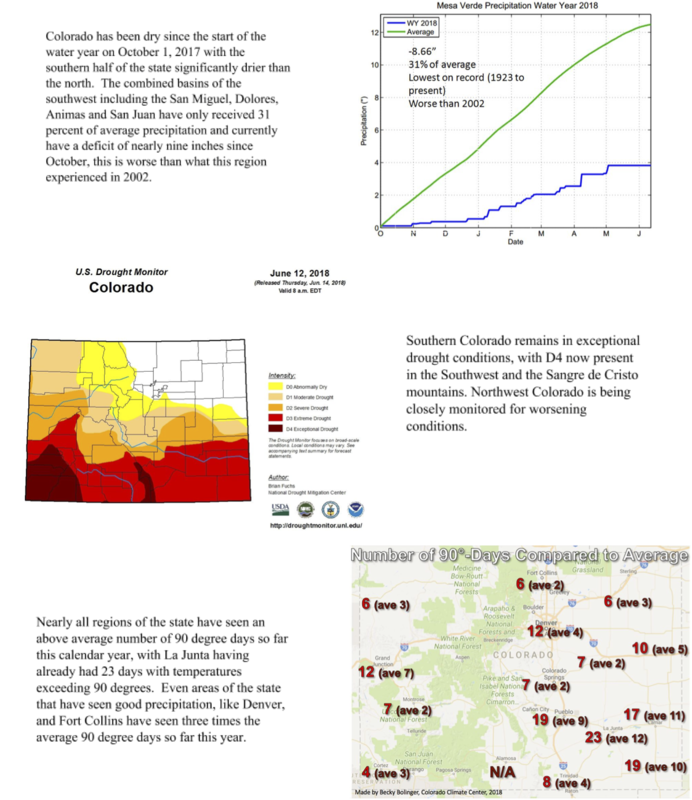 ■ As of June 12, exceptional drought, D4, continues to affect southwest Colorado and the Sangre de Cristo mountains, covering eight percent of the state. Extreme drought, D3, covers 27 percent of the state; severe drought 16 percent and 16 percent is classified as moderate drought. An additional 12 percent of the state is currently experiencing abnormally dry conditions (see image on reverse side). ■ Reservoir storage statewide is at 106 percent of normal. The Arkansas basin is reporting the highest average storage at 127 percent. Front Range water providers are seeing an increase in demand but mainly draw water resources from areas of the state that received near normal winter precipitation, and therefore have adequate supplies and are not anticipating any water use restrictions outside normal operations. ■ The Surface Water Supply Index (SWSI) values have declined slightly in June,​ ​with most of the western slope classified as extremely dry. These values are largely driven by well below average streamflow forecasts. Low streamflows are also a contributing factor to aquatic wildlife impacts that have been reported in isolated areas.